On January 24, 2014, we interviewed Ali Mustafa live from Egypt on the Friday of the weekend marking the third anniversary of the popular uprising that captured the global imagination and put fear in the hearts of despots everywhere. Over a terrible connection and crackling phone line, Ali’s voice was difficult to make out as he described the scene: “the streets are empty, it’s almost eerie and ominous the way the streets are deserted.” The reception on the line was so bad we had to cut the interview short, promising to have Ali back on the program for a longer interview. We never got that chance. Ali Mustafa, 29, was killed Sunday in Syria by a bomb dropped by the Assad government’s air forces. Over 100 hundred people attended an impromptu vigil held Sunday night in Toronto, where Mustafa came of age as an activist and a radical journalist. He participated in campus politics, Palestine solidarity work, the Greater Toronto Workers Assembly and other social justice initiatives. In recent years, he travelled extensively to report on the Middle East as an independent, freelance journalist. In 2011, all eyes had been on Egypt, with Tahrir the rallying cry of progressive people around the globe. By early 2014, after full military rule had been restored in last year’s coup d’etat and the democratic movement drowned in blood, the world was no longer watching Egypt. Shamefully, significant sections even of the left both within Egypt and internationally explained away the coup or ignored the bloodshed that followed in its wake. 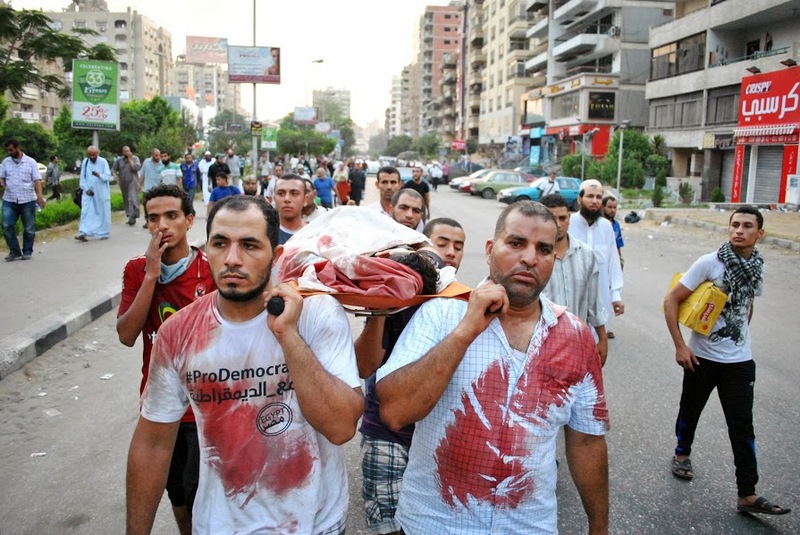 Ali had the capacity and the courage to speak out against the brutality of the Egyptian army. With his words and his camera, Ali strived to show the world what was happening in that country. Whereas many have now conveniently switched back to opposing the Egyptian military’s repressive rule, Ali’s reporting stands as an example of moral consistency and integrity. Those with a habit of political expediency could learn a thing or two from Ali Mustafa about honesty. In the case of Syria, Ali had little time for fanciful thinking. His main concern was the plight of the Syrian people. With the photos he took inside the war zone and in refugee camps, Ali brought to the fore the massive scale of human suffering. At the same time, he also reminded everyone, with pictures of Syrian children in refugee camps with smiles and peace signs, that hope has yet to be extinguished and the war has not destroyed the spirits of the Syrian people. Ali was killed by the Assad regime, reportedly by barrel bombs dropped on the city of Aleppo. Any tribute to him would be incomplete without an unequivocal condemnation of this war crime, and of the regime that killed him and countless others. Sadly, the mainstream media too often ignored the human tragedies that Ali was covering. He made several mainstream network appearances, on CBC and CTV, but these were far too few and too brief. A democratic, healthy media would have provided numerous outlets for Ali’s reporting. The alternative media’s support for Ali’s work was, unfortunately, also not what it should have been. As we reflect on Ali’s life and work, those of us in the alternative media should also introspect and recognize our shortcomings. Ali was clearly frustrated by the seeming indifference from the media and Canadian public to the suffering in Egypt, Syria and beyond. This indifference was painful, but it did not deter him. He carried on his work, faithful to the struggles he knew deserved the world’s attention and action. For this commitment to justice and to journalism, Ali Mustafa paid with his life. The best tribute we can pay to this people’s journalist is to carry on the work, building a better media and a world with less indifference, and more empathy and solidarity. A collection of Ali Mustafa’s writings and photography is available on his blog, From Beyond the Margins. Derrick O’Keefe and Jahanzeb Hussain are co-hosts of the Friday Media Mornings program on Vancouver Coop Radio 100.5FM.